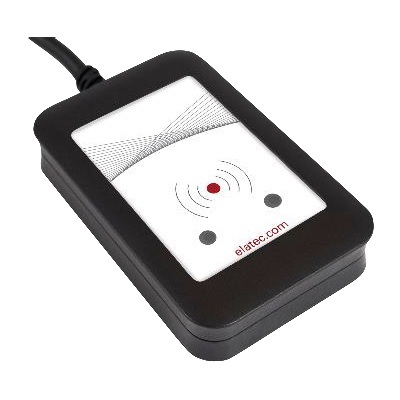 Elatec’s TWN4 family of transponder readers and writers allows users to read and write to almost any 125 kHz, 134.2 kHz and 13.56 MHz tags and/or labels. It supports all major transponders from various suppliers like ATMEL, EM, ST, NXP, TI, HID etc. and ISO standards like ISO14443A/B (T=CL), ISO15693, ISO18092 / ECMA-340 (NFC). The TWN4 MultiTech 2 reader has integrated RFID (LF & HF) and NFC, which is supported by mobile phones with Android version 4.3 or greater. The app on the reader communicates with the NFC module with easy commands.